Brown Butterfly is a multi-media work performed by The Craig Harris Septet, and is based around the movements of Legendary Boxer; Muhammad Ali. 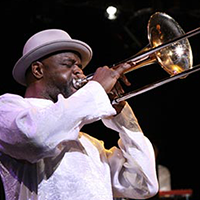 Lead by Craig Harris, an acclaimed jazz trombonist and composer who has been a major figure in the jazz avant-garde movement. Harris has performed with a veritable “Who’s Who” of progressive jazz’ most important figures – his own projects displayed both a unique sense of concept and a total command of the sweeping expanse of African-American musical expression.